I met Jennifer Greer Holmes when she attended my workshop in Adelaide when I was there last summer. I did three workshops in Australia, and Adelaide by far was the most social media savvy of the three cities. Jennifer and I struck up a conversation by email and I asked her if she would share how her company, Vitalstatistix, is using FourSquare. Vitalstatistix Theatre Company was established in 1984 and I started here in March 2009. I immediately overhauled the way we used social media and rapidly built up our facebook friends, and saw great results in attendances influences directly by our facebook presence. Being somewhat of a novice Twitter user until I got a iPhone, I didn’t pick up foursquare until February 2010, during the Adelaide Fringe and I was quickly hooked; both by the “game” of winning mayorships and by the potential it held for marketing. I watched the rapid uptake of people using the application over the next four months and thought about ways we could entice people to our venue (which sometimes suffers from not being located in the CBD – it’s a 25 minute drive out of the city). The only people who had been checking in to Waterside (our venue) were two staff and myself, and I was the mayor, with our admin trainee the mayor of The Deli (our ticketing outlet and reception area). Because we were the most regular check-ins, with no desire to stop or relinquish our crowns, I thought that one of the ways to “reward” a member of the general public for checking in would be to get them to show us their check-in at the bar and we’d give them a drink. Two people took us up on that offer at the first opportunity to do so. I was inspired. It meant I could measure the result of a tip’s effectiveness almost immediately, as well as target people who I want to be part of our audience. The company has made a massive transformation over the past three years, we went from a traditional artistic director lead theatre company to a boutique producer/presenter company. Our audience is changing, too. They are younger, more tech savvy and looking for new ways to engage. Social media is the perfect way to speak with them, in their language (which happens to be my language too!) and about stuff that they think is important/fun/cool/interesting etc. Foursquare slotted into our social media campaigns easily. We knew that Ruby Bruise was going to be our biggest show of the year. An exciting and accomplished artistic team at the heart of the work and an interesting and experimental marketing campaign ensured that there was a big buzz about it. We had made lists of audiences we wanted to attract, and one of them was the audience who go to Adelaide Roller Derby. We saw it as an aligned demographic, made up of diverse groups who might be interested in what we do, if only we could reach them in a new and interesting way… luckily, their grand final was about three weeks before the opening night and again, we used foursquare tips to engage the punters. This time, we were able to be there as well, so we made a stall of our fliers and posters, a display of badges, mailing list sign-up etc and made it look glamorous and theatrical. We also continued our “secret letter” campaign (which was us leaving red envelopes in public places – these contained a letter from Ruby Bruise) and placed some more posters around the place. Ruby Bruise has her own twitter and facebook accounts and was quite popular, with many questions around who she was and did she actually exist, so she had alerted people following her social media pages that she would be at the Roller Derby Grand Final. I really wanted this foursquare experiment to be more interactive, I wanted to meet the people using foursquare and talk to them. So we made a venue tip which said “Head to Vitalstatistix Theatre Company’s Ruby Bruise stall at the Roller Derby grand final to enter an exclusive competition for four square users only. That’s great odds you’ll win something!” We had eight people enter a competition to win a double pass to the show, each one of them joined our mailing list and two of them bought the discount tickets I offered them as a runner up prize. 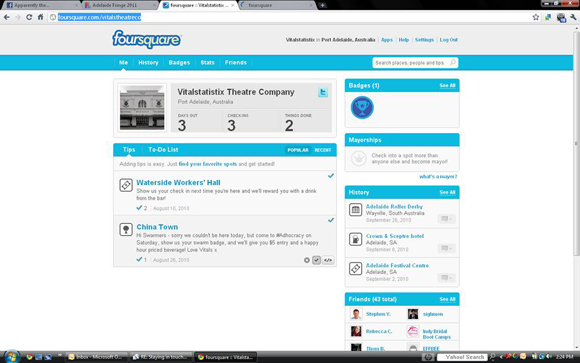 Plus, I got to talk to them about what they’re interested in, how they use foursquare, if they’d ever heard of the theatre company before (only one had, but two had heard of the show). But best of all, each one of them congratulated us on a great idea and none of them had ever been to one of our shows before. I’m looking forward to ‘unlocking’ more uses for this application… it’s pretty cool, I haven’t bothered with facebook places, because I’m a firm believer in supporting the people who thought of it first. But I love the potential that it holds and that it makes it easier to connect in real life as well as online.